Perfumy, elegant and complex. Hints of black raspberry, sagebrush and spice. Luscious, velvety texture. 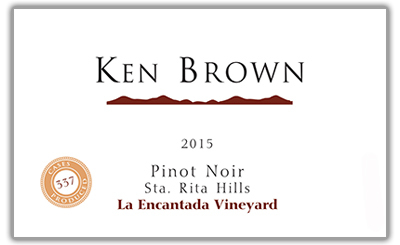 Perfumy, elegant and complex, this Pinot Noir beautifully expresses the hallmark traits of La Encantada Vineyard. Aromas of black cherry and black raspberry are accented by hints of strawberry-rhubarb, sagebrush, rose petal and cinnamon stick. The texture—luxurious and velvety—supports appealing notes of cranberry, raspberry, violets and a touch of spice, culminating in a long, supple finish. The wine’s superb balance and layers of complexity ensure great cellar potential. 100% La Encantada Vineyard, Sta. Rita Hills. Located just west of the legendary Sanford & Benedict Vineyard, La Encantada is in the heart of Sta. Rita Hills’ quintessential Pinot Noir zone. The estate was planted by Richard Sanford in 2001. Comprised of 100 acres of mostly Pinot Noir, this north-facing vineyard is planted on a ridge straddling the Santa Ynez River Valley and is open to cooling marine breezes, which sweep in from the Pacific Ocean. Soils are a combination of clay, loam, shale and sand. Half of the fruit sourced for Ken Brown Wines was the Swan clone while the other half was clone 115. The 2015 vintage is a record vintage in many ways. It was the earliest harvest on record, eclipsing the previous 2014 record by up to two weeks for most varietals. A relatively mild winter led to an early start to the ripening cycle. Once buds began to push, mild spring weather allowed them to develop at an accelerated pace uninterrupted by spring frosts. Yields were record low, especially in Pinot Noir, averaging 30-50% below historical averages. Near perfect ripening conditions coupled with small berry size resulted in superb quality fruit. La Encantada Pinot Noir was harvested on September 1. Pinot Noir clusters for this wine were hand sorted before being de-stemmed and gravity fed to fermenters. The must was immediately chilled for a pre-fermentation cold soak where the most beneficial extraction of color, aroma and flavor occurs. Concentration was enhanced by gently punching down the cap several times per day. The wine aged 11 months in French oak barrels with 37% new French oak in the barrel mix. The wine was bottled on August 2, 2016.